Kim is home recuperating from surgery, this time for uterine cancer. We are hopeful this will be the last one, though of course, one never knows. This is added to a long list of things I don’t know. The questions grow faster than the answers. Kim’s recovery has led to some challenges. After a night in the hospital, she was allowed to leave when she could “tolerate food.” Unfortunately, the test used hospital food, and breakfast included a fried egg white that was a long way from being in a chicken. But she tolerated the white slime, and they let her go. Fortunately, this set the bar pretty low for my cooking when Kim got home. I don’t want to undervalue my cooking. My specialties included roast beef hash that Kim helped me prepare before she went to the hospital, chicken soup that she had made in advance, leftover mac and cheese from the dinner Genne’ brought over, granola parfait made from Kim’s homemade granola, cheeseburgers served with vegetables Genne’ sautéed, lasagna and salad that our neighbors brought over, bagels and cream cheese from Genne’, and a kale salad that I made after Kim showed me a better way to slice the kale. And Cheerios. Kim did fix her famous oatmeal pancakes one morning. And bacon and eggs another morning. Kim’s surgery involved a robot, which I will describe later, and the process included pumping her up with carbon dioxide to create some space between organs so the doctors could cut only what they needed to cut. This gas lingered in Kim’s system for a few uncomfortable days. Some was slowly absorbed. Some may have been released as burps, aided by her chugging small cans of ginger ale. And some chose a southern exit, something that is not part of Kim’s normal vocabulary. We cheered each fart, though we were later told they had nothing to do with carbon dioxide and a lot to do with her prep for surgery. I do not expect that cheering for farts will become part of our family’s culture, but it was, in a way, a bright spot. Another result of Kim’s surgery is the way the anesthesia lingers in her system, slowing and dulling the thinking (though my own slowing and dulling has made this hard for me to notice). Kim has had four surgeries in the last two months, and several more two years ago. She is drinking gallons of water to help flush out her system. I suggested to her that as long as she was feeling the effects of the anesthesia, she should be sure that whenever we have a disagreement, I am right. We’ll see how this works out. We’d been home a few days when Kim discovered a video of the same procedure she had, robotic hysterectomy, performed live, of course, on YouTube. We were squeamish watching them insert a tube to pump in carbon dioxide, another insertion for the camera (with lights, of course), and a few more for the robotic arms that were doing the cutting, cauterizing, and whatever we missed when we stopped watching. The surgeon was leaning into this huge machine hovering over the patient. His arms appeared to be inserted in sleeves, and a computer somehow transferred the movements of his hands and fingers into movements of the instruments nudging around the woman’s inner organs. It seemed a bit creepy having robotic clippers in there rather than the surgeon’s fingers – what if the robot rebelled against its human masters? Yes, we were squeamish, but not as squeamish as we would have been watching doctors cut open the woman’s abdomen. I am slowly getting accustomed to new technology – I depend on the GPS (“Gertrude”) in my car. Meanwhile, we are grateful to be living in a world and a country with such marvels as robotic surgery. And kids, keep playing those video games! 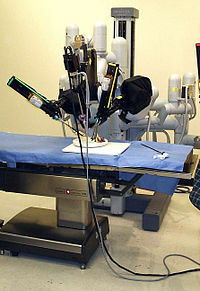 The very expensive equipment is known as the da Vinci Surgical System. According to the manufacturer, the name derives from Leonardo da Vinci’s study of human anatomy, which eventually led to the design of the first known robot in history. We did not see if our friend, Leonardo, painted a portrait on the walls of the body cavity.